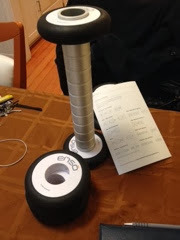 I was recently given the opportunity to try the Ensō roller by Evofit. I have a tried a couple of other popular massaging gadgets and was excited to see one that was customizable. Since I'm not pounding the pavement as often as I used to, I've actually been injury-free for about three years now. However, once in a while I feel myself getting tight quads and calves. Worse, my upper back has been an area of constant struggle lately. I fortuitously won a spa gift card recently and used it for a massage, at which time I was told that my upper back was "really tight." She proceeded to loosen it up -- painfully! -- and then it took a few days until I would touch the area. Fast-forward a couple of weeks... still sore. Carrying my stupid purse/lunch bag during my weekday commute hasn't exactly been helping, either. Anyway, I immediately started arranging the discs per the enclosed instructions. The discs click into place, and given that I recently saw The Lego Movie, this felt satisfying. What I found worked best for me is cramming the discs toward the center. The discs are different sizes, so they end up digging into different muscles. 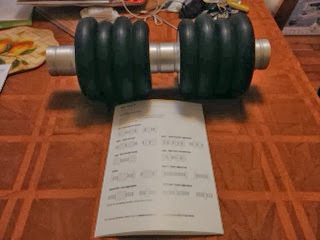 A few of the configurations expose the bar in the middle (I call them dumbbell configurations), but I found that quite uncomfortable for most of my daily niggling pain. I'm sure it would help with a deeper massage, though! Another thing I noticed is that due to its short length, it is more effective to sit and roll this using your hands rather than my first instinct, which is to put it on the floor and roll my body over it. I managed to do this successfully with my quads, but it was tough to do on my back or other parts of my leg. I'm sure this is something that comes with practice. 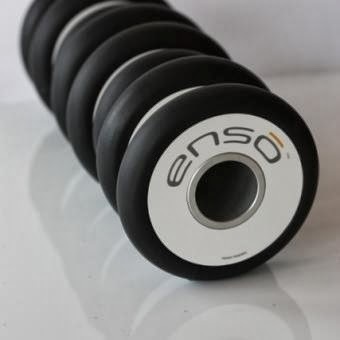 FTC Disclaimer: I was sent The Ensō Roller to review but was not otherwise compensated to provide a particular type of review.